Can I search for a user who has not bought any games? I want to play Path of Exile with my sister, so she signed up for a Steam Account. However, Path of Exile is a free game and when she tried to add friends she got a message stating she cannot yet add friends. Due to spam protection, she must spend at least $5 on games before she is allowed to invite. Is there a way for me to find her to add her account without her having to spend money on games to lift the limited user restrictions to do the process backwards (invite me; send me a friend request)? If you are unable to find your sister's account through searching, try asking her to give you her community profile link, since all accounts are allowed to have a profile. You can find the link by asking her to click on her own name (at the bottom corner of the Steam Client) and copying the link given at the top to you. 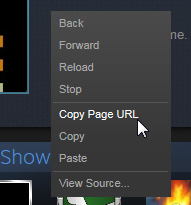 Note: If a link does not appear at the top, enable web-friendly links by going to Steam > Settings > Interface and check Display a Steam URL address when available. These examples have been created with this account. The Steam Limited account restrictions (as far as I can recall) have been around since before 2012. The recent update was only simply a rule change. Previously, you only needed to activate a CD key or make any purchase to lift the restrictions. Now, you have to spend a minimum of $5USD. The only way you can connect with your sister's limited account is for you to send the friend invite itself. As far as I know, there are no trading restrictions on a new account. Except for the usual TF2 thing where item drops are non-tradable until upgraded to a Premium Account or (and not a standard Steam Account). Your sister is currently a Limited User because, as you said, she has not spent 5USD though Valve's systems. How do I add friends as a limited user? 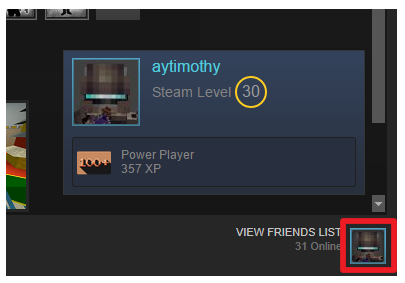 If you can't find this user through normal add a friend search (which seems to be a weird restriction by Valve), access their profile directly. To do that you need their profile url, and for their profile to be public (at least until you are friends). She can then share that url with you though your preferred methods, you can visit that url though a normal web browser, login, and you should be able to send a friend request. Is there any way to get a refund for a game bought from Steam? Can I search for co-op games in Steam? Do I have to use Steam for games I bought on disc? How can I sync achievements for Steam games bought through another vendor? Can I see cards for games I do not own? Can I search my Steam library titles and sort them by user review? I bought Astroneer on Xbox, which has Xbox Play Anywhere enabled. Can I play with people on my PC who bought it via Steam? Can I search my Steam library for absence of a tag? Where to search for steam greenlight games in the steam launcher?